Et Verbum: Simple instructions On The Holy Eucharist As A Sacrament And Sacrifice by The Very Rev. Geo. Edw. Canon Howe. Part 8. Simple instructions On The Holy Eucharist As A Sacrament And Sacrifice by The Very Rev. Geo. Edw. Canon Howe. Part 8. Hitherto we have always spoken of the bread and wine as the two elements constituting the Sacrament of the Holy Eucharist, and yet we daily witness the Faithful going to the Altar, to receive it under the form of bread only, while it is the priest alone who receives under both kinds, when he offers the Holy Sacrifice, and therein consecrates the two. 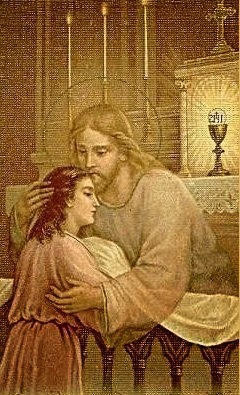 It becomes necessary, therefore, to devote some attention to this subject of Communion under one kind only, a subject that causes surprise to many outside the Church, to whom we must be able to give an explanation of what to them seems difficult to reconcile with the words of Scripture, and to make clear to them why the Cup is withheld from the Laity. The difficulty will be easily solved, if we recall to mind the doctrines of the Real Presence and the Incarnation. In Holy Communion we receive Our Lord as He is now—a living body. Now, where the living body is there also must the blood be, and there, too, the soul ; and through the Incarnation, Our Lord's human body was united to His Divinity, and once united, they can never be separated for all eternity: this hypostatic, or personal, union of the two natures can never cease. When then the words of Consecration are pronounced over the bread, we have present, under the form of bread, not merely Our Lord's Body, but the whole Christ—Body and Blood, Soul and Divinity. In like manner, when the wine is consecrated, we have present, under the form of wine, not only Our Lord's Blood, but again Christ Himself—God and Man. We use the word Concomitance to express this doctrine of the Church. Moreover, all this is true not only of every consecrated host all the world over, but of every particle of such host, as the Council of Trent declares ; for, Christ being now glorified in Heaven, His body is no longer subject to suffering or death. Were it otherwise, He would be slain again every time Mass is said, because in virtue of the words of the two-fold consecration, the Body would be separated from the Blood. A broken mirror will reflect an object in each of its parts; the voice of one man may be heard by a thousand or more listening to him, so Our Lord in the Eucharist is truly received whole and entire under every consecrated particle of bread, and under each drop of consecrated wine, just as our soul is whole and entire in all our members, for it is a spirit and indivisible. For this reason, it is quite lawful for the priest, when distributing Holy Communion, to divide particles, if he sees he is about to run short of them for the numbers of the Faithful coming to the Altar, a practice not desirable in itself, perhaps, yet preferable to the loss of Holy Communion by a number of persons, and practice grounded on the solid principle that Our Lord's Body is now indivisible, and where that is, His whole being is, as already expressed :— " There is no breakage, no dividing, Whole He comes to every one." 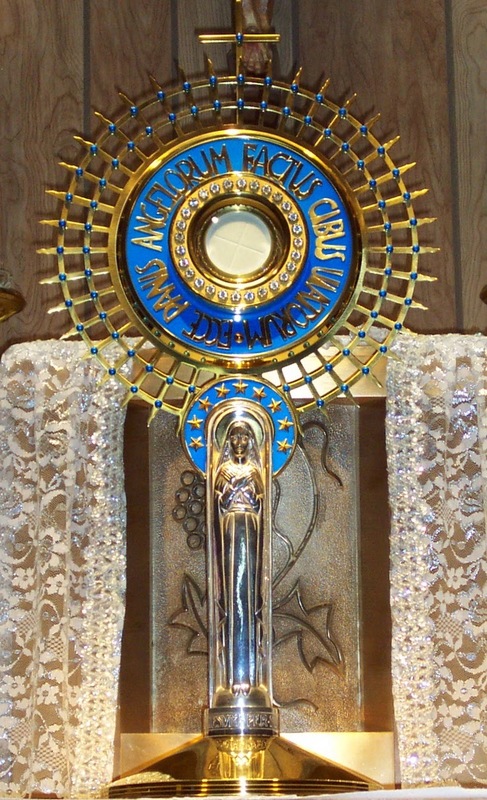 It is on account of this belief that the priest, at the end of Mass, gathers up very carefully any stray particles that may perchance be lying on the corporal ; these he puts into the chalice, that they may be consumed along with the Precious Blood ; for each little particle that may chip off from the consecrated Host truly contains the Real Presence of Our Lord, and therefore must not be knowingly allowed to remain in or on the corporal. For a similar reason, out of respect for any such particles as may after all remain on corporals, these and the mundatories, that serve to clean and dry the chalice, must be washed in three separate waters by one in Holy Orders, before they are handed over to the laundry or the housekeeper, to be done up again for further use. This triple water is not to be thrown carelessly away, but is put down the sacravium, that it may run into the earth. All this proves how jealous is the care the Church ever takes of the consecrated elements, based on her deep belief of the Real Presence under each of them alone. In spite of what opponents may say, the doctrine of the Church, as to Communion under one kind only, is quite in accordance with the teaching of Holy Writ, and is therein fully justified. For, as the Council of Trent again remarks, if Our Lord said : " Except you eat the Flesh of the Son of Man, and drink His Blood, you shall not have life in you," He also said : " If any man eat of this bread, he shall live for ever" (John vi. 54, 52). If Our Lord said :"He that eateth My Flesh and drinketh My Blood, hath everlasting life," He said also : " The bread that I will give is My Flesh for the life of the world" (John vi. 55, 52). 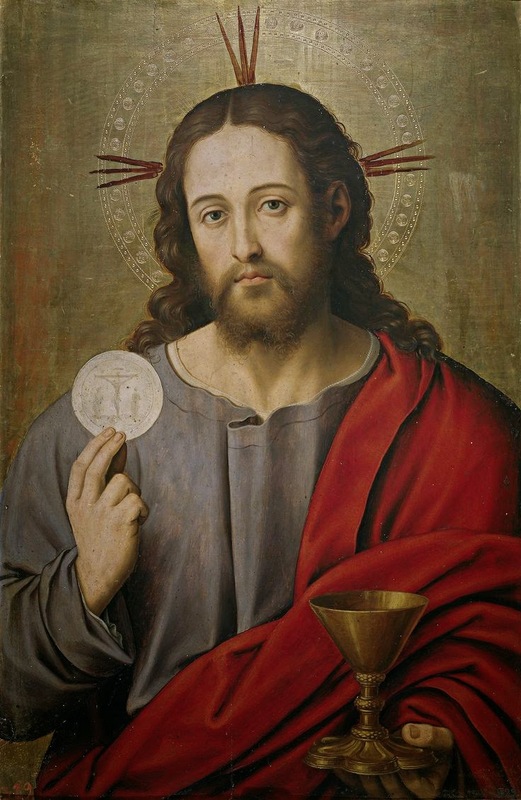 And again, though Christ said : u He that eateth My flesh and drinketh My Blood, abideth in Me, and I in him," He likewise said : " He that eateth this bread shall live for ever" (John y i- 57' 59)- Thus we have our Divine Saviour, who instituted the Holy Eucharist, making the same promises to those that eat only as to those that both eat and drink, because, whether under the form of bread alone, or under the form of wine alone, He is received whole and entire, the whole Christ, God and man. Similarly, S. Paul boldly declares him who eats or drinks unworthily to be guilty of the Body and the Blood of Christ (i Cor. xi. 27), for, whether under one species or the other, the whole Christ is contained and received, Body and Blood, Soul and Divinity. These words clearly suppose the Body and Blood to be present under both or either species, otherwise how could the Apostle be warranted in making so strong an assertion ? They also imply that the two species are not necessarily to be taken together in Holy Communion. The practice of the Church from the earliest ages teaches the same doctrine, and confirms our belief in the truth here asserted, that under either kind alone we receive our Divine Lord whole and entire. For, from the very days of the Apostles, Communion under the form of bread alone was constantly practised, as it is now in our own time. When the followers of Our Lord were subjected to the terrible persecutions of the first centuries of the Christian era, and had to serve God in fear and trembling and in secret, the Holy Eucharist, in the form of bread only, was oftentimes committed to their pious care, by them taken to their homes, and then received, when in danger of being apprehended, so that they might be strengthened in courage by this heavenly Food, if summoned before the judges to profess their faith and die. 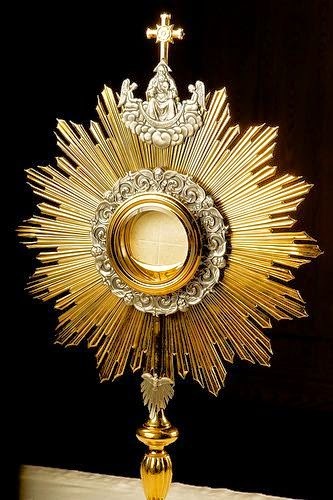 In like manner, the Blessed Sacrament used to be sent, in the form of bread only, to such as were in prison, and could not therefore repair to the Church to receive it. S. Tharcisius was arrested by the pagans, while thus carrying the Holy Eucharist on one such occasion, and was stoned to death, because he refused to betray it to them. Another instance of the Church's practice herein is that it was quite customary in former ages to give the Holy Eucharist to little infants, just after their baptism, by administering to them a few drops of the consecrated wine only, not the consecrated bread, but only the one species. The Anchorets, too, who withdrew to the deserts, in order to attain to greater perfection, by leading solitary lives away from the world, used to receive and preserve the Holy Eucharist, under the form of bread only, and communicate themselves therewith, as they might desire. From such testimonies as these, Ecclesiastical History is able to show that, from the earliest ages, Communion was often given under one species only, and they prove that we of the twentieth century agree in faith and practice with the early Christians, believing in the real and permanent presence of Our Lord, under either species, whether of bread or of wine alone. By the commencement of the twelfth century, the idea began to crystallise that this practice of administering the Holy Eucharist under the form of bread only, which was so usual in given cases, should now become the rule rather than the exception. A number of circumstances led to this common feeling; for instance, accidents had happened, whether through awkwardness or inattention, in giving the Cup to the general Faithful, and the Precious Blood had been spilled, which we can well imagine to be very easy. As the numbers of the Faithful increased, the difficulty increased also of administering the Cup to large crowds of people, gathered together at the Altar rails. Then again, if more wine were consecrated than proved to be needed for any given occasion, there was a danger of its becoming acid, and so losing its nature of wine. Now, when the accidents of wine are no longer there, then does the Real Presence cease to be there. This would be an irreverence to be avoided at all costs. Moreover, numbers of people have a distaste for wine, and are really unable to take it, whom it would be cruel and unreasonable to compel to receive their Holy Communion under that form. While lastly, as the Church developed and spread into the colder regions of the North, a scarcity of wine and a difficulty in obtaining it began to be felt, which almost put it beyond the reach of such countries to consecrate sufficient for the Faithful to receive under both species. Thus, generally speaking, a desire to secure greater reverence for the Sacrament was the leading idea that induced the Church to legislate in the direction of requiring henceforth that the Laity should receive their communion under the form of bread alone. It was only, however, in the year 1414, that the Church definitely determined the matter, at the Council of Constance, in opposition to the teachings of John Huss and others, in Bohemia, who falsely asserted that the use of the Cup was absolutely essential. Such doctrine was never held by the Church ; on the contrary, from all that has preceded, we know what had been a common practice with her, and what Our Lord Himself had said on the subject. The belief of the Faithful guarded them against ever thinking that they received less benefit from Communion under one kind than under both, while the Council of Trent authoritatively declares that they are not thereby defrauded of any grace necessary to salvation. With this infallible voice to guide us, we may rest well assured that we suffer no real loss, and may live in peace and security, giving a childlike obedience to the decisions of the Church. It is entirely a matter of discipline only, and not of doctrine. The discipline of the Church may change from time to time, as circumstances may require; and, if ever it became necessary or advisable again, the Church could alter the decree of Constance, and require the Faithful to receive under both kinds. She would still be consistent and true to her teachings, while it is the heretics that are guilty of innovation, in introducing a new principle, opposed to the teaching of antiquity. How marvellously one the Church ever is in her doctrine! Unity is one of the chief marks of the true Church, and is in a conspicuous manner shown forth in this instance, that while her ceremonial and practice may vary, and have varied, in different ages, always and everywhere her teaching is uniform, that, under each species separately, there are truly and really present the Body and Blood, the Soul and Divinity of Our Lord. On this dogma is based her practice of administering Communion under one species only.